F/S Douglas William Vaughan, RNZAF NZ429046 – Navigator. Killed age 28 on the 23rd of April 1944. Son of William Vaughan and of Florence Evelyn Vaughan (Nee Ayres), of Geraldine, Canterbury, New Zealand; Husband of Muriel Belle Vaughan, of New Plymouth, Taranaki, New Zealand. Grave location – Allied Mil. Plot. F/S Mauson Lammas, NZ421728 – Pilot. F/S Douglas William Vaughn, RNZAF NZ429046 – Navigator. F/S Robert Bailey, RNZAF NZ429072 – Air Bomber. Sgt. William Frederick Harrison, RAFVR 1396448 – Wireless Operator . Sgt. Edwin Henry Thomas, RAFVR 1811856 – Flight Engineer. Sgt. Patrick Frederick Butler, RAFVR 1384944 – Mid Upper Gunner. Sgt. Ivor Larson, RCAF R.192316 – Rear Gunner. Stirling Mk.III EF137 AA-E was shot down by a night-fighter at 23:15hrs over Denmark, crashing in flames near Vemmenaes, East South East of Lundby on Tasinge Island. The aircraft broke up on impact and came to rest in shallow waters, where the bodies of all seven crew were recovered and later buried in Åbenrå cemetery. F/S Terrance James Vercoe, RNZAF NZ415566 – Rear Gunner. Lost without trace age 27 on the 31st of July 1943. Son of James Mostyn Innes Vercoe and Muriel Patricia Vercoe, of Paengaroa, Auckland, New Zealand. F/O Richard Barry Vernazoni, RNZAF NZ416185 – Pilot. Lost without trace age 20 on the 30th of May 1943. 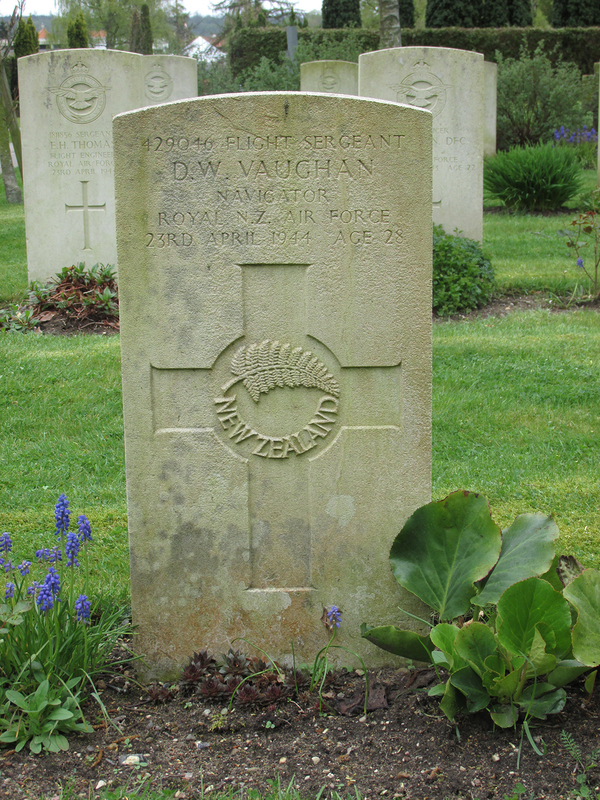 Son of Roger S. and Freda Vernazoni, of Sydenham, Canterbury, New Zealand. Sgt. Eric Clifford Viccars, RAFVR 649196 – Mid Upper Gunner. Killed age 22 on the 14th of July 1943. Buried Southend on Sea (Sutton Road) Cemetery, Essex, England. Sgt. Eric Viccars was killed when he became trapped in his gun turret after the aircraft he was in crashed whilst attempting to perform an emergency landing. After crashing, the aircraft instantly burst into flames. Sgt. Viccars dies despite the heroic efforts of HIs Pilot to save him from the burning wreckage. F/S Charles Henry Vickers, RAFVR 1115126 – Front Gunner. Killed age 22 on the 29th of August 1942. Son of John Henry and Mary Louisa Vickers, of Newton Heath, Manchester, England. Grave location – XII. E. 10. Son Of Arthur Edward And Muriel Ada Vincent, Of Felixstowe, Suffolk.